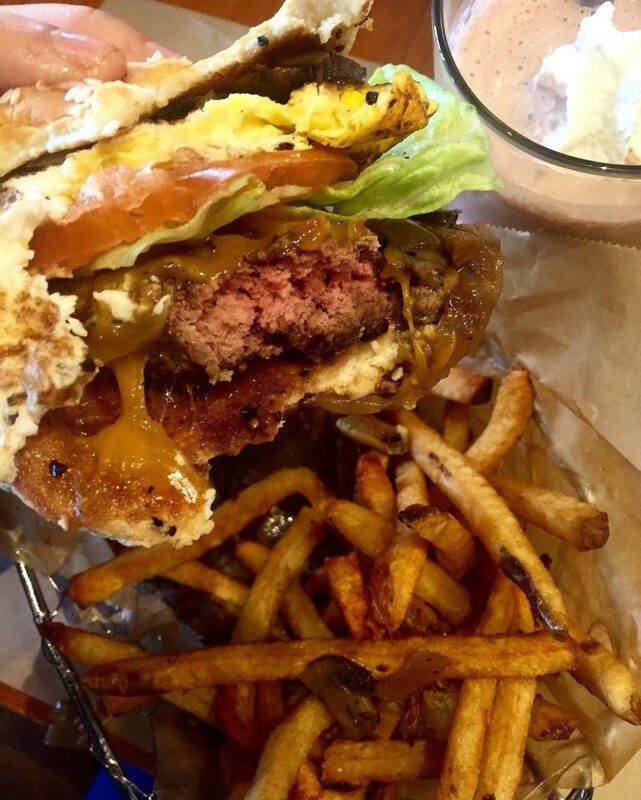 The most unique burgers in Asheville that will surely make your mouth water before you order. A line of customers with enormous appetites wrapped around the block of Patton Avenue in downtown Asheville, anxiously waiting for the doors of Farm Burger to open. The doors finally part, and the hungry crowd files into the rustic atmosphere with a modern twist. 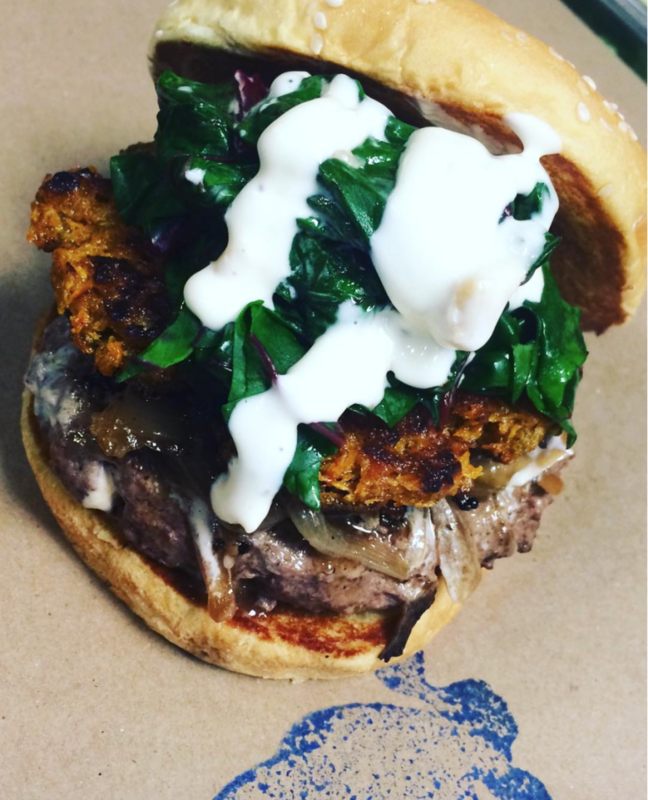 The new twist on the common phrase refers to Farm Burger’s unique beef creations and combinations of flavors that send willing customers on a mouth-stuffing adventure that requires two hands, too many napkins to count, an open mind, and an unquestionable love for beef. Farm Burger’s menu gives customers the freedom to choose a one-of-a-kind upscale burger—100 percent grass-fed without antibiotics—and whatever specialty toppings handmade with ingredients from local growers the stomach desires. From the famous FB sauce (a tangy mayo) or farm-fresh fried egg, to the surprising oxtail marmalade or southern pork belly, these are no ordinary burger toppings. What is this madness, one may ask? I decided to find out. On my first visit, I played it safe, choosing a classic selection with a few new additions: a juicy burger layered with sautéed mushrooms; sweet, caramelized onions; fresh lettuce; sliced tomato; and gooey, cheddar cheese topped with a fried egg. Each layer satisfied a different and primal sense. The sound of the crisp romaine lettuce; the sweetness of juicy plump tomato; the smell of the tangy, sharp cheese; the beauty of the expertly fried egg; and the taste of the beef seared to perfection all wrapped in the golden, browned bun sent this burger experience to a brand new level—one that I never imagined in my wildest, food craving dreams. Not to be undone, tasty mushrooms toppled out of my creation on to crisp, hot fries as warm, meat juices carelessly ran down my wrists with each bite. I had entered Burger Heaven. Amen. May I have a second to that—burger that is. Believe it. Yes, Ashville’s Farm Burger, part of the upscale chain started in Georgia, is definitely worth the wait. Bring family, friends, and a date or dates as the case may be—why waste it on just one! But, don’t play it safe. Arrive hungry to experience the ultimate burger high and be prepared… it’s about to get messy.